What is your white tail deer hunting lodge like in terms of accommodations? White tail deer hunting is a pleasure at one of the most beautiful hunting lodges in Missouri you'll ever come across, Lost Quarter Farms. We make hunting for deer a vacation to remember with cozy accommodations and wonderful natural surroundings. When you're not hunting you'll enjoy your downtime in comfort and enjoy home-cooked meals in our lodge. With two lakes on the property and mature large timber everywhere you'll enjoy scenic surroundings that are best enjoyed from a seat on the porch. Once you cross the private bridge that leads to our property you'll begin enjoying one of the best Midwest best deer hunting tripsof your life. Make your reservation today! Reserve your place at our historical lodge and bask in a beautiful setting with some of the most fertile hunting grounds you'll ever experience. No matter how many deer hunts you've experienced you're certain to remember your visit to Lost Quarter Farms in Missouri. 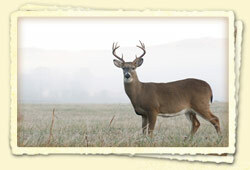 We offer great white tail deer hunting, and our location is known as one of the finest hunting lodges in the country. There is a reason people travel from all over the country to hunt here. It is the combination of great hunting and comfortable accommodations that make a visit to Lost Quarter Farms a great all-around trip. We look forward to you joining us at Lost Quarter Farms. If you're planning a hunting trip we can accommodate you and make it one of your best trips ever.